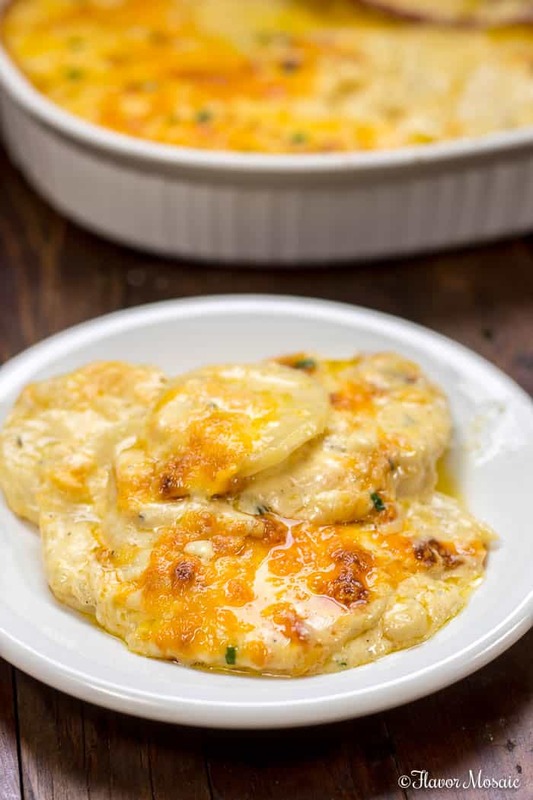 Easy Cheesy Scalloped Potatoes are very similar to Potatoes Au Gratin because they are drenched in a creamy, cheesy, garlicky cream sauce and then covered in more cheese! 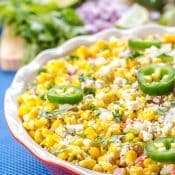 They make a perfect comfort food side dish for all your holiday dinners! 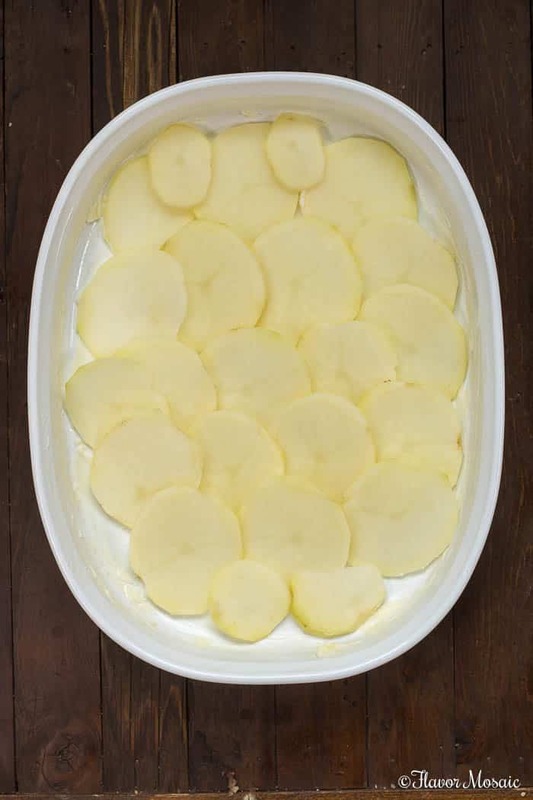 Scalloped Potatoes are sliced potatoes covered in a cream sauce and baked in the oven. My Easy Cheesy Scalloped Potatoes recipe expands the definition of scalloped potatoes. They may be considered to be more like Potatoes Au Grain, but not exactly. So this begs the question. 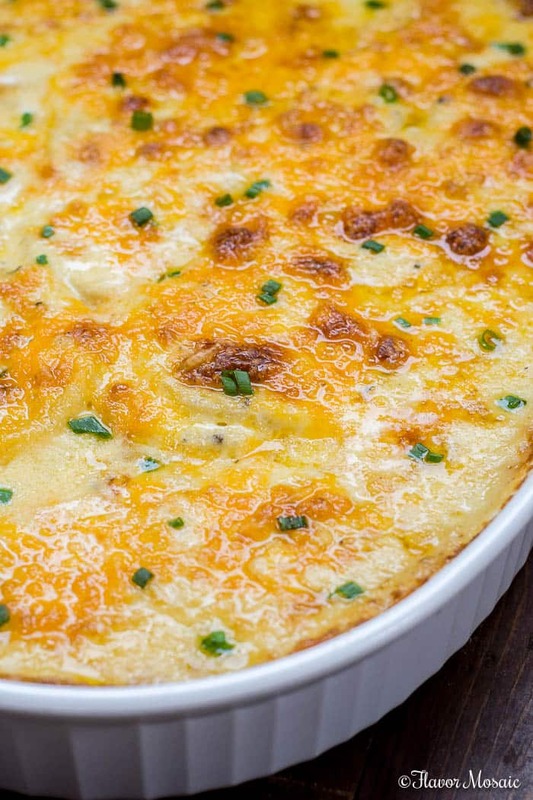 What Is the Difference Between Scalloped Potatoes and Potatoes Au Gratin? Scalloped Potatoes are sliced potatoes covered in a cream sauce and baked in the oven. In the classic definition, there is no cheese. Potatoes Au Gratin, on the other hand, has cheese sprinkled in between the layers of potatoes and cream and are typically topped with bread crumbs. Is This Recipe For Scalloped Potatoes or Potatoes Au Gratin? My Easy Cheesy Scalloped Potatoes recipe is basically a mash-up between Scalloped Potatoes and Potatoes Au Gratin. It includes a garlic cream sauce, like traditional scalloped potatoes, but in addition to garlic and cream, I add onions and cheddar cheese. Then I sprinkle more cheddar cheese between layers and on top. However, this recipe contains no bread crumbs. Therefore, I decided to call it a Cheesy Scalloped Potatoes. But if you prefer, feel free to call it Au Gratin Potatoes or Potatoes Au Gratin. 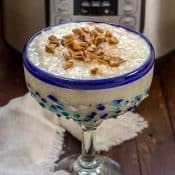 No matter what you call it, the recipe is crazy delicious! What Makes This Scalloped Potatoes Recipe Work? Cheese. Oh, cheese, that glorious cheese! You can’t have too much cheese! Did I mention that this recipe has cheese?! 🙂 It uses 3 cups, or 24 ounces, of shredded cheddar cheese. Quality Ingredients. 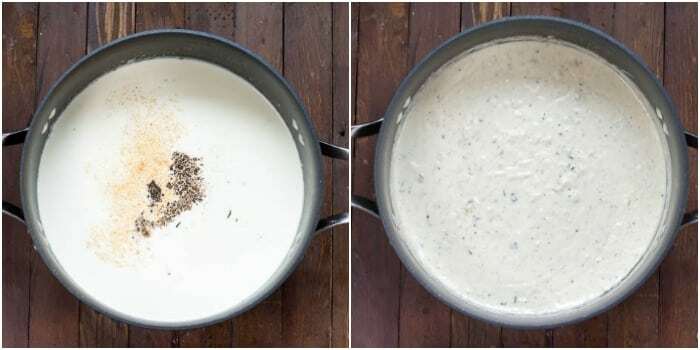 The keys to making this recipe work are using real heavy cream, real butter, and a good quality cheddar cheese that has been freshly grated, instead of a package of pre-shredded cheese. Evenly Sliced Potatoes. For these Easy Cheesy Scalloped Potatoes to cook evenly throughout, the potatoes need to be thinly sliced and evenly sliced. If some slices are thick and other potato slices are thin, then the dish will cook unevenly. What Ingredients Are Needed For Scalloped Potatoes? Potatoes. Russet potatoes or Yukon Gold potatoes work the best. I had russet potatoes on hand. However, I really like the buttery flavor and creamy texture of the Yukon gold potatoes for this recipe. Butter. Real butter tastes the best. However, you could use margarine if you have that on hand. Onion. 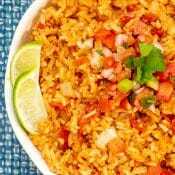 I chop up a white onion for this recipe. 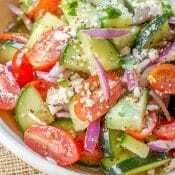 However, you can use a Vidalia onion or sweet onion, or leave out the onion altogether if you prefer not to have onions. The recipe will still be delicious. Garlic. 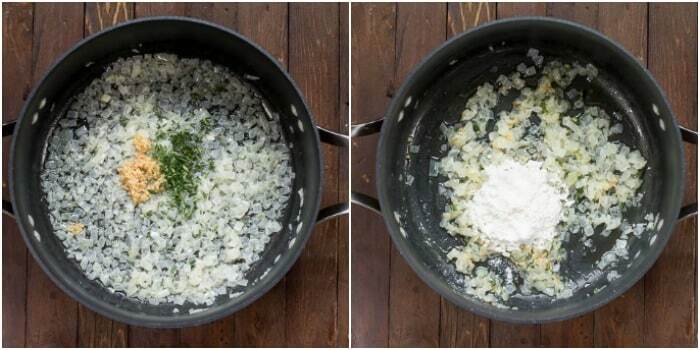 Used in the cream sauce, garlic is a must for that garlicky flavor. I mince the garlic and add to the melted butter. Heavy Cream. The heavy cream makes the creamiest sauce and I highly recommend using cream in the sauce. However, if you don’t have heavy cream on hand, you can use milk instead. I would recommend using whole milk or 2% and not lower fat milk. Flour. A little flour is added to the butter to create a thicker sauce. 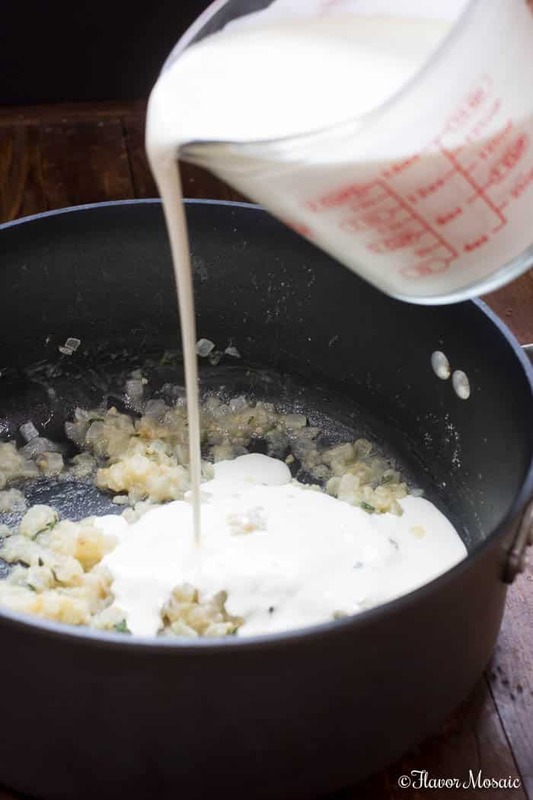 However, to make this gluten-free, instead of using butter, you could thicken the sauce by mixing a little cornstarch with cold milk or cream and then add to the sauce. Salt and Pepper. This is a must in almost any recipe, including this one. Thyme. Used to add flavor to the sauce and potatoes. Cayenne. To add a little more flavor, heat, and depth, I like to add a sprinkle of cayenne to the sauce. However, this is completely optional. If you prefer, leave out the cayenne. Cheese. 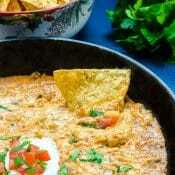 Shred a good quality cheddar cheese to come up with 3 cups or 24 ounces of freshly shredded cheddar cheese. 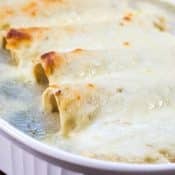 If you want to use another type of cheese, Gruyere, Mozzarella, White Cheddar, or Parmesan work well with the garlic sauce. Chives. I like to use chopped chives as a garnish. It adds flavor and color to the dish. Peel the potatoes if you like, but that is completely optional. Leaving the potatoes unpeeled makes the dish a little more rustic and saves time. However, traditionally for this dish, the potatoes are peeled. Slice the potatoes between 1/8″ and 1/4″ (or 3 – 6 mm) thick. This step is NOT optional. If you slice the potato too thick it won’t cook quickly enough. If you slice the potatoes too thin, then you may end up with mashed potatoes or potato soup. If you have some thin slices and some thick slices then the potatoes won’t cook evenly. To help make consistent even thin slices, use a mandolin to slice the potatoes. Otherwise, use a sharp knife and thinly slice the potatoes as evenly as possible. Add 3 Tablespoons butter to a saucepan over medium heat. Stir until melted. Add chopped onions and stir. Cook for about 3 minutes until the onions are soft. 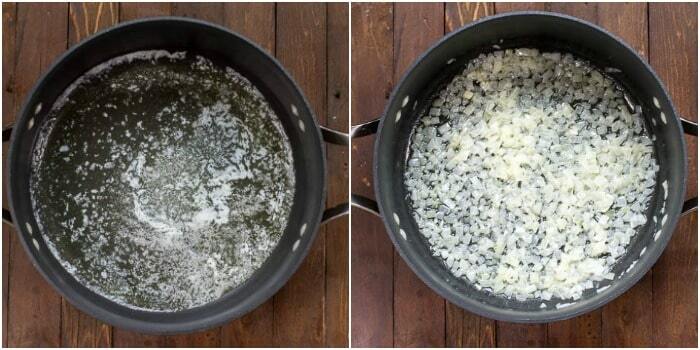 Add minced garlic and stir for one minute. Add salt, pepper, thyme, and cayenne and stir. Stir in 2 cups (16 ounces) of shredded sharp cheddar cheese. Stir until the cheese is melted and the sauce is smooth. Butter the bottom and sides of the baking dish or spray with cooking spray. Layer half of the sliced potatoes on the bottom of the baking dish. Pour half of the cheesy garlic cream sauce over the top of the potatoes. Spread the sauce out so it covers all of the potatoes. Sprinkle with 1/2 of the shredded cheddar cheese. Repeat steps 2 – 5 for the next layer. Sprinkle the top with chopped chives, thyme, or chopped parsley. 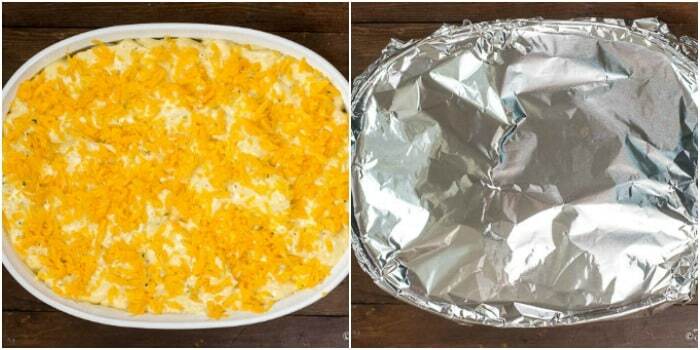 Cover the casserole dish with aluminum foil. Bake for 40 minutes in a preheated 375-degree F oven. Sprinkle the remainder of the shredded sharp cheddar cheese over the top of the scalloped potatoes. Bake for 20 more minutes or until the cheese is melted and the potatoes are cooked through. Garnish the Scalloped Potatoes with chopped chives, parsley, or thyme before serving. When To Serve Scalloped Potatoes? Serve when the Easy Cheesy Scalloped Potatoes have cooled for 5 or 10 minutes but are still hot. These scalloped potatoes make an excellent side dish for a Holiday dinner or Weekend dinner. Can I Make Scalloped Potatoes Ahead Of Time? Yes. 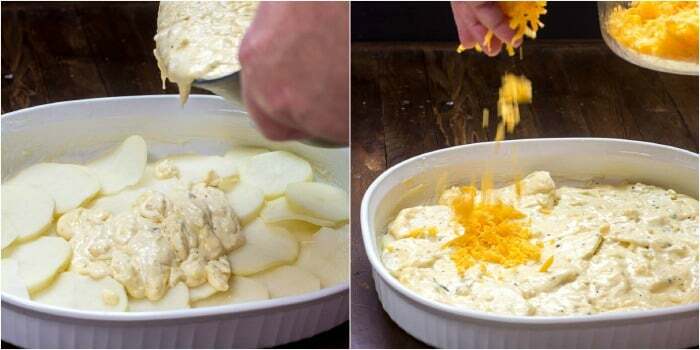 Follow the steps of making the Easy Cheesy Scalloped Potatoes through when you cover the casserole dish with foil. Then, instead of putting them in the oven, you put them in the refrigerator until you are ready to serve. You could do this the night before and then cook them the next day. Can I Freeze Scalloped Potatoes? Yes. Place the already cooked scalloped potatoes in airtight containers. 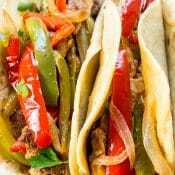 You can freeze them for up to 2 weeks. 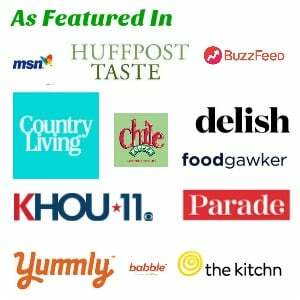 Can I Make Scalloped Potatoes In A Crock Pot or Slow Cooker? 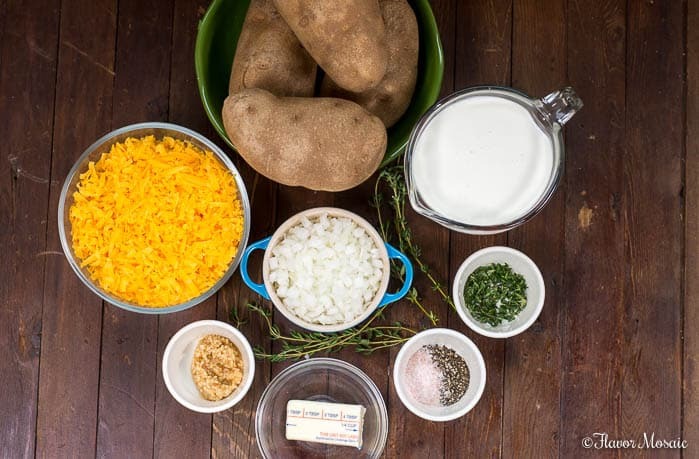 Peel potatoes and make the cheesy garlic cream sauce, and then instead of laying the sliced potatoes in a baking dish, layer the ingredients in Crock Pot or Slow Cooker instead. Pour the sauce over the top and sprinkle with cheese just as done in the written instructions above. Cook the Easy Cheesy Scalloped Potatoes on high for 4 hours or on low for 7 – 8 hours in the slow cooker. What To Serve With Scalloped Potatoes? Ham – Honey Baked Ham Recipe – by Life Tastes Good – A stunning, classic holiday centerpiece that is an easy recipe to make at home. It is a real crowd pleaser with a sweet, crispy brown sugar ham glaze atop the juicy, spiral sliced ham and ham gravy. 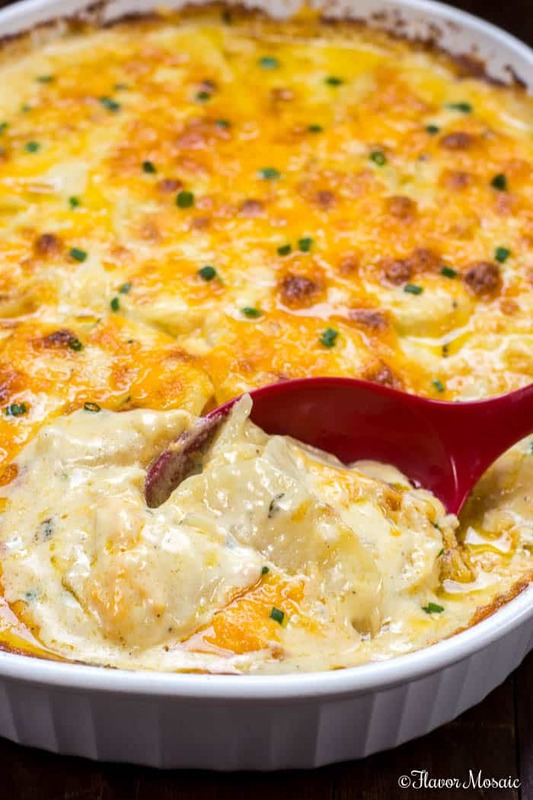 This is an excellent choice to serve with the Easy Cheesy Scalloped Potatoes for a holiday dinner. Turkey – Roast Turkey With Apple Cider Brine is our family’s recipe for a moist, juicy, and golden roast turkey for our Thanksgiving or holiday table. Chicken – Serve with the Crock Pot Roast Chicken or Oven Roasted Chicken for a wonderful tender, juicy rotisserie seasoned whole roast chicken for Sunday supper, Thanksgiving, Easter or other holiday dinners. Pork Chops – Baked Pepper Sage Pork Chops are an easy, delicious, savory main dish that can be served on a date night or a weeknight. Prime Rib – Cajun Herb Prime Rib – also known as a ribeye roast, will bring family and friends together around the holiday table to enjoy its tender and juicy roasted flavor. Meatloaf – Brown Sugar Meatloaf – This Brown Sugar Meatloaf recipe is the best meatloaf ever! It is even better than Mom’s meatloaf with its brown sugar, onion soup mix, Worcestershire and hot sauce! Asparagus – Asiago Bruschetta Roasted Asparagus, with tomatoes, garlic, onions, and asiago cheese, makes a healthy gourmet side dish that can be on the table in 15 minutes and is perfect for brunch, or a weeknight or holiday dinner. Green Beans – Creole Green Beans are savory and spicy and delicious with bacon, onions, tomatoes, chilies, and cajun seasoning and make a perfect Cajun Side Dish for Mardi Gras or any time. 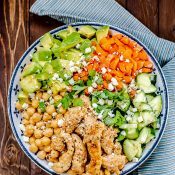 Broccoli – This Broccoli Salad – is a perfect cold summer salad when trying to beat the summer heat by chillin’ at a backyard barbecue, picnic, or potluck. Crock Pot Roasted Potatoes – are russet potatoes roasted in a crockpot or slow cooker with garlic, Italian Seasoning herbs, including rosemary, and parmesan cheese. These Crockpot Roasted Potatoes are perfect for a weekend or holiday dinner. Mashed Potatoes – These creamy, buttery mashed potatoes make an excellent side dish to any holiday or weekend meal. Oven Roasted Garlic Herb Potatoes – Buttery Oven Roasted Potatoes coated with olive oil, garlic, herbs de Provence, and freshly grated parmesan cheese. 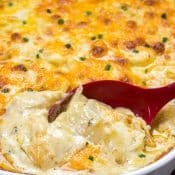 Now that you have all the information you need to make the recipe, when are you going to make Easy Cheesy Scalloped Potatoes? Leave a comment and let me know. Peel potatoes, if desired. (Optional.) Thinly slice potatoes (1/8" to 1/4") in even slices. Add the chopped onions and stir for about 3 minutes until the onions are soft. Add minced garlic and thyme and stir for about one minute. Stir in 2 cups (8-ounces) of shredded sharp cheddar cheese. Stir until the cheese is melted and the sauce is smooth. Remove from heat. Butter a baking dish or spray a baking dish with cooking spray. 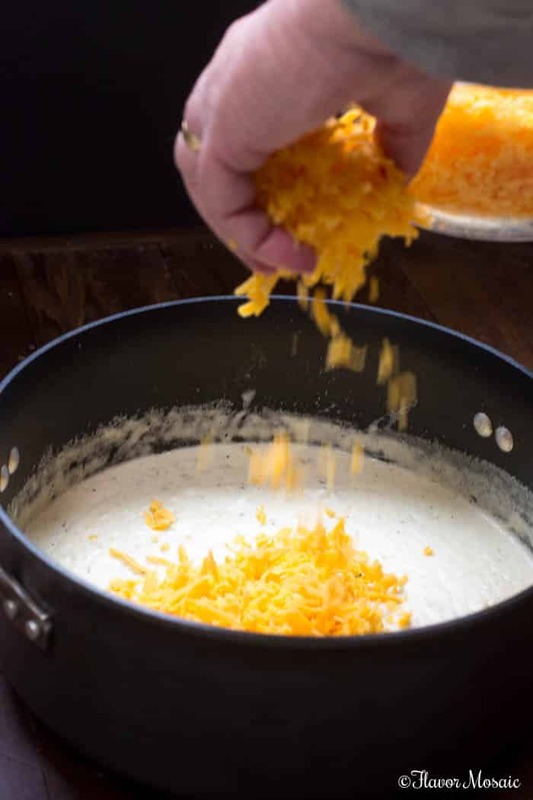 Sprinkle with 1/2 of the remaining shredded cheddar cheese. Repeat above 3 steps for the next layer. Sprinkle the top of the scalloped potatoes with chopped chives, thyme, or chopped parsley. Remove from oven. Garnish the Scalloped Potatoes with chopped chives, parsley, or thyme before serving. My Cheesy creamy scalloped potatoes turned out good. I think I added too much cheese as I am a Cheese Head here in Wisconsin. Thank you for the recipe!! !